Finally, our second visualization challenge comes to an end. We got a winner. Readers from all corners of earth responded enthusiastically to this challenge and submitted 32 truly outstanding entries. I have compiled all of them in the sales dashboards post and asked you to vote for a winner. And now we have winners. 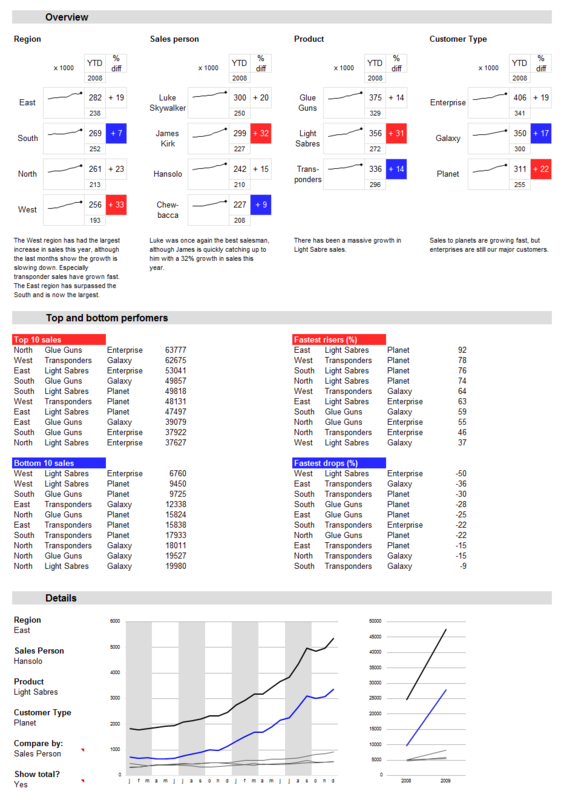 Alex Kerin – who writes at Data Driven Consulting, made this dashboard using MS Excel and Fabrice’s free sparklines add-in. 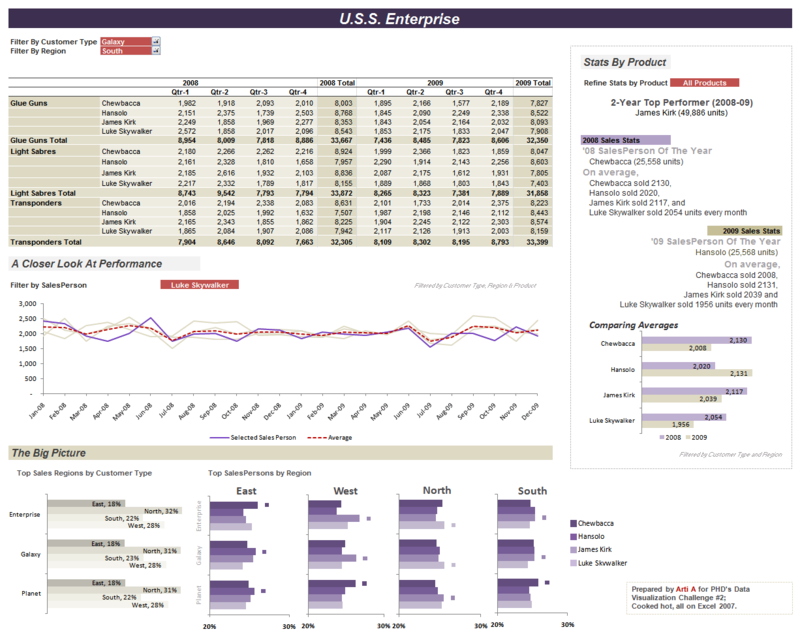 The dashboard clearly shows sales performance summaries at sales person level (a stated objective of this challenge), along with various key metrics. It follows key visualization principles, he used fewer colors, kept things as simple as possible and include headline messages. Alex’s entry received 23 votes. Congratulations Alex. You will receive an 8 GB iPod touch very soon. Cuboo – who writes at Open BI, made this dashboard using MS Excel & Palo. Cuboo is not new, he won the previous visualization challenge as well. Cuboo’s entry received 22 votes. Congratulations Cuboo. You will receive a copy of project management excel templates. 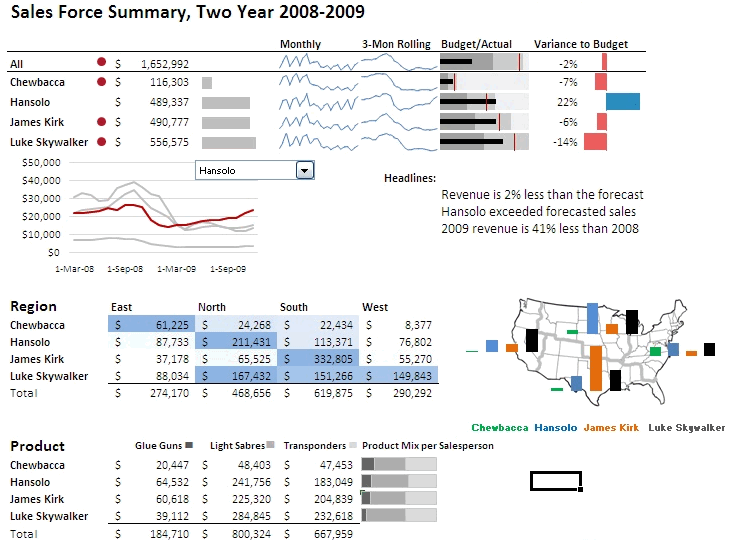 Esteban, made this dashboard using MS Excel. Esteban’s entry received 15 votes. Congratulations Esteban. 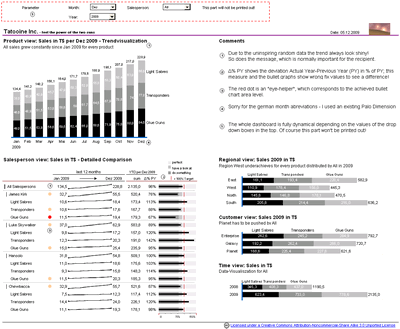 You will receive a copy of project management excel templates. 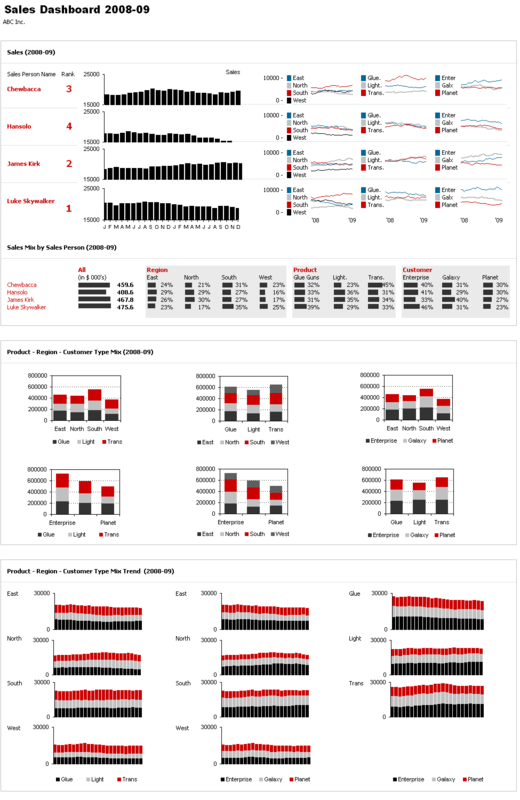 While there are several very good dashboards (and charts) submitted for this challenge, I *personally* liked these dashboards too. Thanks to Zoho Reports and @aravind for pro-actively approaching me and sponsoring this contest. Thanks everyone for your support, participation and enthusiasm. You have made this contest a memorable experience for me as well as countless PHD readers. Thank you. Congratulations Alex ... I like your dashboard very much! Fantastic ! Congratulations to all participants and to Chandoo for organizing this ! 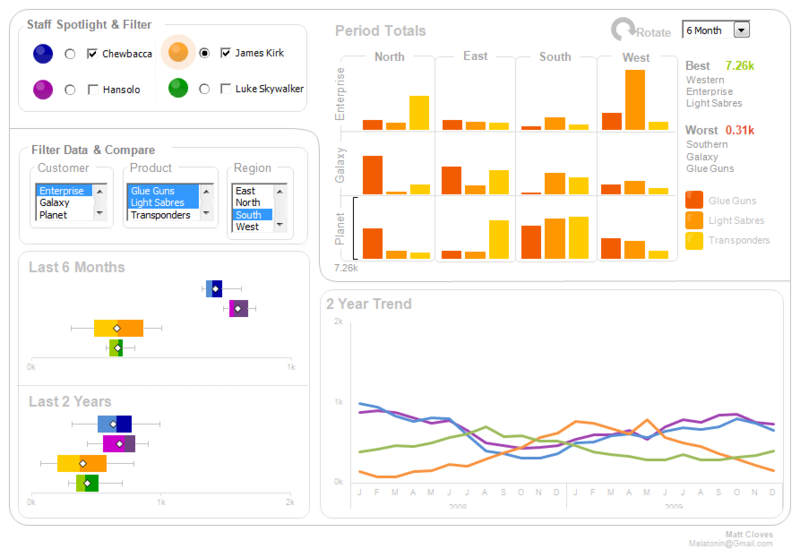 Such a great gallery, almost all dashboards bring something to learm from !! Can't wait to see the next contest, and jump in. Alex, Cuboo... I love what you have done w/ Sparklines !! Thanks a lot ! Chandoo, how many votes in total ? @Fabrice... there were 150 votes in total. 2 of them are test votes by me, 2 duplicate email ids, 4 duplicate users (same email id on various domains). I am very happy with the voting process (although it is not fool proof, very little gaming of it was done). Coboo dashboard "Download Source Files" link points to an image. Could you share the xls, please? Thank you for voting for mine - I was surprised - there were so many great entries. I think I voted for Cuboo's in the end. As I compare mine to others, it's clear that I need to work on making my work look less Excel-like - I will be drawing inspiration from here.. Thanks to Chandoo and Zoho. Thank you for your compliment, but the first time I saw your entry, I knew I wouldn't win, because your Dashboard looks "nicer" 😉 ... It's only one vote, but I did some "advertising" on my blog! On the other hand: I am on the brink of starting a bigger software development project, so I could use the project management tool from chandoo very well. Thanks again chandoo for this phantastic contest. Looking forward to use your tools. Thank you all for providing me the link! I'll try it together with Palo. i follow your websites very closely. 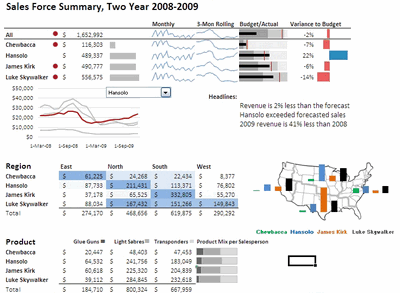 Congrats Chandu, for bringin excel up close and fascinating !! @Biray... they are not XML files, the whole package (.xlsm) is an excel macro file that works in Excel 2007 and above. @Alex.. Can you post your source files in Excel 2003 format if possible? (by removing CF heatmap etc...) ? @Rohit.. thank you, that is so *sweet*. That was a great contest, Chandoo! Congratulations to Alex and the other winners from Zoho Reports! 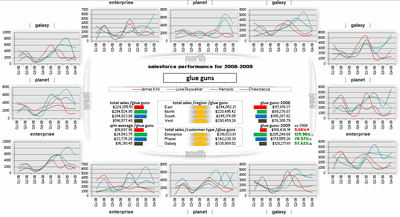 I saw that a lot of source data was modifed, Alex and Arti. Can you help me regarding modifying data like Arti did? Did you use some kind of tools for this or you do it "by hand"?